Slip st into first petal and finish off. Sorry I didn't include the steps and photos side-by-side, but I thought by including some photos, you could at least have a gauge for how it should look! Good luck! You can see photos of my finished blanket here. To see how to add rounds go here. Such a cute pattern! Would you be willing to share how you make the rest of the block? I made the daisy but I can't make the block look right. ch2 (or ch3 for some - I just like to do 2) - this counts as the first dc; then 2dc, ch1, 3dc - this is your first corner, * 3dc in the next two spaces, 3dc, ch1, 3dc* repeat from * two more times, 3dc in next two spaces. Join with a slip st. Fasten off. I hope that makes sense. As I mentioned, I'll try to take some new photos of this as soon as I can. Have a great weekend! Yes, would really love the pattern for the rest of the block. Please share! Hi fessup - I just posted a reply with quick instructions as to finishing up the square. I will try to get some more photos up soon! I LOVE this! sooo pretty! And Daisies are one of my favorites :) thank you so much for sharing your pattern. You are so welcome! I hope you have a terrific weekend and thanks for stopping by! I too would love the rest of the block pattern if it is at possible! My daughters name is daisy and I just know she would love this blanket with a pink border! Hi Georgia, I just posted a small reply to Kim about the border for this square. I'll try to take some photos soon. Thanks for your nice note and for stopping by. Hope you have a great weekend. P.S. I love that your daughter's name is Daisy! I love this! Beautiful! Going to buy yarn to get started tonight! What brand of yarn are you using? Love your blog! Hi Carrie, Thanks for stopping by and thank you for your nice note. I use just about any yarn I can get my hands on! The yarn that I used in this particular blanket is Hobby Lobby's "I love this yarn" - it's very soft and smooth. Thanks Laura for the quick instructions. Mine came out beautiful. Thanks again for your pictures they are really helpful. I will post the square on my blog:) I am so glad I found your blog and you do such awesome stuff. Can't wait to try this one. This is one of the best daisies I've seen. They make me happy! Thanks for such a nice note Karen! You tutorial was excellent. Thank you for taking the time to show us how to make this cute daisy. I appreciate the feedback. I'll try to keep adding more as I get the chance. Thanks for stopping by! This is one of the best granny squares I've seen, thanks so much for sharing! You are so welcome Joyce! Thanks for stopping by. Hope you have a terrific weekend! Awesome work and thank you for sharing. My daughter is an art major that is going off to college next year after two years of community college. She and I are TIGHT, so this will be a big change for us both. I plan on sending her off with this (blue and yellow version) since she is a HUGE daisy fan. Keep 'em coming! Thank you k2sfi! It must be bittersweet to send your "little girl" off to college! It sounds like the distance will only make your bond stronger. Thanks again for such a nice note! Your tutorials are great.A non crochet person like me too can read and make things after going through your wonderful tutorials. Hi, first of all, I so appreciate that you posted the pattern for this as I've had it pinned on Pinterest for a while and have been excited to make this for my sister-in-law who loves daisies and the color lilac. I am starting today...I just have a question; when you start the new color for round 2 with a slip stitch and then do a tc, for me it doesn't seem to work, not sure if I've missed something or am doing it wrong, but it pulls the slip stitch up funny. Could I join with a slip stitch, ch 4, do 2tc, and then take the hook out to join them at the top? I hope this question makes sense, I don't mean to waste your time. Thank you so much! Hi Amanda, Thanks for stopping by! To answer your question, of course you could use a ch4 to begin the petal. For some reason, I try to avoid beg chains - I'm not sure why exactly! I just don't like the look - and I found it harder to pull through. It's all subjective, and I am always open to the traditional way or another! Good luck with your afghan! I tried this today and I'm having the same problem. 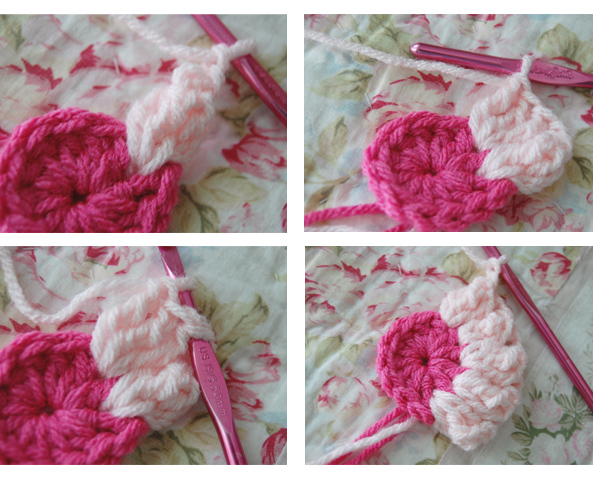 Saw a video on YouTube under crochet daisy granny square by create crochet she said after the slip stitch chain 4 then do the treble crochet you will end up with the same height as the treble cr. The chain two is equivalent to a dc. Hello! I was wondering, is it ch-2 or ch-4 between the petals? It's a ch 2 between petals. i did this with a G hook but I read in another comment that you use an I hook, so i'll be giving that a try! thanks again for this beautiful pattern! Thank you so much for sharing the pattern. I am going to make one as a Christmas gift for someone. I love this! Thank you for your nice note. Let me know if you get a photo up somewhere of your finished work; would love to see it! Have a very nice weekend! sorry my english, I'm from Brazil. Ariane - Your pillow covers are beautiful - maravilloso! doyou have the remaining rows instructions?? Hi Heather, If you look at the very bottom, where it says: "To see how to add rounds go here." Click on the "here" and it will take you to the next steps. I just add a simple granny border to the ch2 spaces, but I did take some photos to show how I do it. I hope that helps. Happy crocheting! Luna, it's beautiful. We just got back from a trip and part of it was driving through the mountains of West Virginia - all of the trees are beautiful fall colors; so many colors reminded me of your blanket. I found your blog off of Pinterest but I wanted to let you know that I am currently doing my own version of a daisy blanket with your daisy pattern. I love how easy it is! Thanks so much for sharing. Because the blanket is a surprise I cant post it until it is finished but would love to tag your blog in it for the pattern if you dont mind. Hi Jenni, Thanks for the note! Would love to see your final blanket -- It's fun to see all of the variations people have come up with. I don't mind at all if you'd like to link back. Hope you had a wonderful weekend! hi there. i love the look of your daisy . have you written the instuctions in 'americian terms' a here in UK we refer to dc as a double-crochet whereas in USA is a treble. wouldn't it be easy if everyone had same terms for the stitches!! Hi Val - thanks for your note. Yes, I have written in American terms, so the trebles are doubles. I agree - it would be so much easier if we all just followed the same terms! (I also prefer metric, so much easier than inches and ounces over here - I wish we'd convert to that too!) Have a lovely rest of your week! But I have a question. 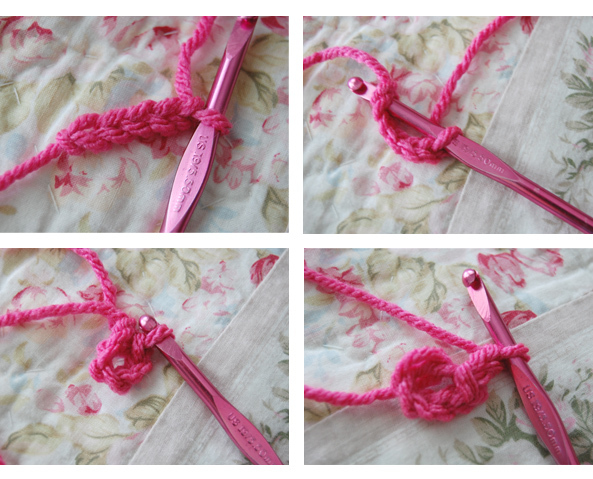 Do I need to crochet 4 tc for every petal? or just 3? Hi nenemoosha, I'm sorry for taking so long to get back to you! It's 3tc for each petal. I only start with a ch2 for the first petal as a "build up" - for some reason I don't like how a ch3, 2tc looks at the beginning, so I ch2 and 3tc for the first petal. I hope that makes sense. Happy crochet! I am new to crocheting and I want to thank you for sharing such an easy pattern, but I am having problems with my petals. My petals are flat and don't stick up like yours. Could you tell me what I might be doing wrong? I am using an I hook. Thanks so much! Hi Amanda, if you click on "Tutorials", then "Join as you go", it will show you how I join my squares. Good luck! Hey Mz Tillie! I love that you are kind enough to share this tutorial with all the rest of us! I just started mine, and its so easy! Found you via Pinterest, and love your blankets! My mother's name is Daizy and she has a scottie trailer all done up in daisies, so for her b'day, I want to give her a blanket to match, using your tutorial! I'm using the same yellow and white for flowers, but the squares will be 2 shades of green because bright green is my mom's favorite color. haven't decided yet wether to border in more white, or darker green, so any ideas would be helpful. Thanks again for sharing! Lots of love from the South! It's a fun square to do, with so many options; your colors sound beautiful - and what a thoughtful gift for your mother! I think the dark green would be dramatic. I worked on a light blue baby blanket that I was going to join/edge in bright blue, but the squares took a backseat to other projects...I will have to get those out and finally finish it up! Happy hooking! I really love this daisy square . I'd like to share this tutorial with Japanese bloggers. Thanks again for the wonderful pattern. That's very nice of you ayaka. Hope you have a wonderful weekend! Thanks for the nice note Chel! Good luck with the square - once you get into a groove with it, it's a fun one to work up. 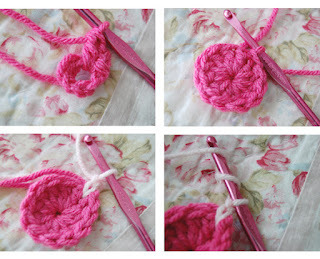 Hi I love this Daisy :-) but as a newbie to crochet can I ask what size hook you use and what type of yarn? I look forward to making some more as a valance in the girls' bedroom! Hello Dear Laura, I am delighted with your blog, or rather amazed both beautiful work, congratulations friend, worthy of an artisan, I am participating in the blog, do I take an invitation to come see my work and me will be a pleasure to-it also participating in my blog, a big hug and a wonderful Wednesday to you Laura. I am having such a hard time trying to figure this out - do you have a youtube channel to create a video tutorial? What size hook are you using? Very pretty. This is gorgeous!I've become obsessed with crochet and granny squares recently and this has just jumped to the top of the list because it's so lovely. Once you get the hang of it, it's quite fun! Thank you for stopping by and leaving a message! I end up with eleven petals! If you do 11 dc into circle, then that makes eleven spaces to make eleven petals. What am I doing wrong? The chain two at the start of the round count as the first double,you then slip stitch into the second of those chains when you have done the 11 dc this gives you 12 dc and 12 spaces for petals. I've been crocheting amigurumi for a couple years now, but granny squares befuddle me. Getting them to match and be the same size is impossible! But I figure I'll try a couple more, and make a really funky backing for a couch or something, my best friend likes daisies and purple. Thank you for the inspiration you give me! Lovely and simple,an excellent pattern .Thank you I shall be using this square.I am making a blanket between continents,I am in the UK and my daughter is in Australia so I am making squares and sending them to her and she is doing the sewing together.It will take ages but each parcel she gets reminds her of love from home. What a nice idea. Some days I wish I had someone to sew in all of my tails! Everything else so much fun to do; it can be almost meditative. I hope it turns out lovely. Cheers from across the pond! Beautiful pattern! I'd like to make one for my 6 yr. old niece. Can you tell me how many skeins I'll need of each color and the finished size? Hi Judith, You may have already started on your blanket, but for a throw sized afghan I used 1/2 of a one pound skein of worsted weight, about a pound of the petal color, and 1-2 pounds of the outer border color. Of course, it depends on the hook and your tension too. Good luck and thanks for stopping by! .I've been waiting for your response before I started. Thank you! You can check me out at http://masqueradingcrafter.blogspot.com. I found your blog and pictures of your daisy blankets and immediately fell in love!! Daisies are my favorite flowers. :) I'm finishing up my first daisy afghan -- for my daughter's baby girl who was due yesterday! 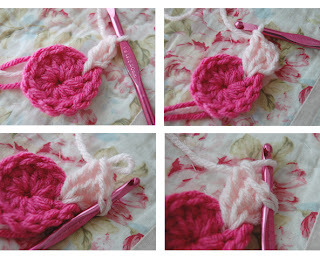 -- and am going to post pictures of it on my blog next week (www.GoCrochetCrazy.blogspot.com). Thank you so much for your blog...love your work! Keep it up! This is such a pretty blanket! I'm thinking about making it for my future Niece!! then, they got a little puffier. But, not much. Any idea? The Shasta daisy blanket is so pretty! I just the love the bright femininity of it!! Hi Sherilyn, I appreciate you asking. That would be fine. If you could include a line in your listing: "Inspired by a tillie tulip design." I would appreciate it. Happy crocheting, and have a wonderful weekend! Just beautiful. When using the Caron One Pound what is the size of your blocks? Hi Carlene, the squares are around 5.5-6" depending on your hook size (I use an I hook) and tension. How many squares do you make for a throw? Im on my 6th petal, it looks neat and fabulous. Thanks to you and Laura. Hope I will be able to follow the instructions for the next round, i.e making it to square. I've created a little coin purse using your flower pattern, and wanted to put a pattern together for free download on Ravelry, but wanted your permission to reference your work first before I did it. Is this okay? If you let me have an email address for you, I can send you a copy of the pattern before I put it up so that you to put your eyes over it first. Or alternatively, I can be reached on crochetteaparty [at] gmail [dot] com. Thanks for a lovely site with so many inspiring things. This is so beautiful! I absolutely love this blanket pattern! Would you mind sharing with me what size and type of yarn you used and what size needle you used? Thank you so much for asking. I would be fine with that as long as you could mention tillie tulip somewhere in your post. Dank u wel! This is such a beautiful pattern! I was wondering if you wouldn't mind sharing what type of yarn you used? There are so many different types out there and I always like to see what people tend to use (and prefer to use). I realize this is an older post, so don't even know if you'll even see this. I've just found you through a link from another site. On the daisy tutorial, are you using US or UK terms? This is lovely pattern, and your chosen colors are just so soft and pretty. It always amazes me how giving this crochet community is! Being somewhat new to the 'community' I am so overwhelmed that so many share with the rest of us so generously. Hi LitlBits, Thanks for stopping by. All of my patterns and tutorials are in US terms. Isn't the crochet community awesome? I have learned so much from others, and I try to give back when I can. I have been away from the blog for awhile - busy with kids, work and life in general, but I hope to get back to it soon! I have you had a wonderful weekend! would love a video tutorial on this!!! Love love love this pattern! Unfortunately, I don't have a video of this yet! I was wondering how much yarn of each color to buy to make this blanket. I am wanting to make this for a friend at Christmas with greens and purples instead of pinks. She loves daisies so this is perfect. I'm not sure how the Paris Drops yarn works up, (or your tension). I would also do few squares and keep track of your yarn. Good luck! Great, thanks! I look forward to trying this. I'm not understanding how you get from petal to petal Do you tie off each one to do the next? I always start with a Magic Circle....when you pull up your yarn and secure it, there is NO whole in the center. Just make sure you secure it well - or your work could unravel from the center out. I do knot it (with tapestry needle) and the knot can easily be pulled into stitches and will disappear. This is a great pattern! I just finished my 1st blanket and starting on a 2nd for christmas presents! Thank you so much for sharing! Hi Linda, I am actually in U.S. and the crochet terms are in fact U.S. Hope that helps! Do you have the rest of the pattern to finish the square after the daisy is finished? I've picked up crocheting again after a 30+ year hiatus. I'm loving it and able to do so many more stitches now. I've stayed away from granny squares due to all the tie-ins. I never knew that you could attach the squares as you go along. However, I ask, are you sc each stitch on the borders at the end to get the raised effect on each square? I love the raised look. This daisy blanket is just stunning. Thank you!! Side question....I assume if you join as you work on the blanket you can't have the raised borders, correct? A. Canyou post the pattern for the complete square .please . B. Can i alao make this pattern with Thread crochet ..if yes ..then what size thread and steel hook will be able to give this dimensional look . Is this the same pattern used to make the blanket you made with tge yellow and white daisy with the pink granny squares? I was trying to find that pattern so I could crochet tge blanket for a friend whose daughter is expecting a baby girl. How do you attach the daisy to the blanket?? I am currently making the Blue Daisy blanket for my daughter and I would like to find out what method you used to joint the granny squares? Hi Cristina, I used the join-as-you-go method. I have a tutorial for that as well under "Tutorials" at the top. Hope that helps. Beautiful! I realize this is an older post, but I see a lot of fellow crocheters are still commenting... could you be so kind as to tell what brand of yarn you used for this project? I usually use Hobby Lobby's I Love this Yarn, but I recently used Red Heart's LOVE. And I am currently doing a baby blanket with cotton Peaches and Cream, but I really am not liking very much. I'm thinking about trying Bernat Super Saver. Thank you! I am a Caron One Pound kinda girl :) But I like Hobby Lobby (their pink and aqua), and I've used Bernat Super Saver quite a bit (although it's more of a light worsted) but I'm still happy with the final product. I have no problem mixing and matching all yarn families, but try to stay with the same weights and fibers. The colors I used in this tutorial (I think) were Hobby Lobby Hot rose and Soft Pink. I hope that helps! Hi Darlene, If you would like to sell blankets made with this pattern, that is fine, however, I do ask that you note where you found the pattern, and I prefer that they not be identical as I do sell my blankets online as well. I would kindly ask that you not copy the daisy square pattern verbatim to sell as it is here for free. Thank you. hi Laura. I made a beanie hat for sale using your pattern, is it ok? Hi there, I use US terms. Have fun! I just finished this blanket and an so happy with it!! Can you tell me about the border? Could you please tell me what edging you used to sew the squares together? This is absolutely beautiful. Thank you. Hello, I have just made my first baby blanket as a gift for a friend's daughter who has just had her first baby. I don't think I can put a picture here, but it's turned out pretty nice and I've so enjoyed making it. So thank you very much for this pattern! Just finished a purple one for my best friend. She loved it! I wish I could share it! it came out wonderful, thanks for the pattern! I am sad it won't let me put a pic. I am still new to reading the crochet lingo but my first one came out okay! I did 11 but I think it needs 12 to make it have 3 to make a square. This is absolutely the cutest baby blanket. I saw it in grey, turquoise and pink and they are so pretty. I am a knitter but will attempt my hand at this one! Hi! I love that this daisy pattern doesn’t have a hole in the middle, like the last one I tried. I just wonder if this is UK or US crocheting terms? I'm a bit confused... are you using UK or US terms? What is the treble stitch? I am a mom to two and (if there is any time left in my day) I love to knit, crochet, paint, quilt, sew...anything that keeps me creative. I hope this blog will inspire others, as I have been inspired and helped along the way with tips, tutorials and beautiful images. Hope you have a wonderful day! The Muse: A Little Corner of Bates Mercantile Co. Please note: All artwork, photos and postings are copyrighted. You may link back to my blog, however, contact tillie tulip for permission before using any item in any form. Please do not copy, re-post or sell any of my patterns. Thank you!